When you think of Queenstown, you’d be forgiven for immediately thinking of epic ski fields and heart-stopping vertical plunges. The extreme sport capital of the world, it’s packed with alpine adventures and mid-air thrills, with adrenaline junkies from all of the world flocking for activities like Heli Skiing, skydiving and bungy jumping. But what about adventure on the water? Away from the snowfields, glaciers and sky high bridges, Queenstown houses some of the most incredible water-based experiences in the world. Surrounded by beautiful lakes, rivers and fjords, Queenstown is perfect for enjoying life on the water - be it a leisurely lake cruise or an adrenaline-pumping jet boat ride. Queenstown offers a huge number of aquatic adventures, so without further adieu, let’s take a look at what’s on offer for all you water-loving thrill-seekers. World-famous for being the ultimate jet boat experience, Shotover Jet has thrilled more than 3 million people since opening in 1965. Take a breathtaking ride through dramatic and narrow canyons, and hold on tight for insane 360 degree spins. Watch as your driver whips the powerful boat past rocky outcrops, and skims around crags and boulders at 85 km/h. From the moment the accelerator hits the floor, your adrenaline will skyrocket as you skim the surface of the water. Take on the rapids of the mighty Kawarau River on a purpose-built sled. Travel nine kilometres through some of New Zealand’s best high-volume white water, and experience big, fast-flowing rapids, standing waves, boils and whirlpools. The final section, called the “chill-out” zone, allows you to take in the spectacular scenery. If sledging isn’t your thing, then why not hop inside a rubber raft and take to the river with a paddle in hand? Experience the thrill of rafting through the heart of Middle Earth (the Kawarau River starred as the River Anduin in The Lord of the Rings films) - from the moment you set off, you’ll feel a rush of excitement as you navigate through Grade II and Grade III rapids. If you’re serious about your thrill-seeking adventures, then you simply must sign up for the Queenstown Triple Challenge. First, you’ll need to brace yourself for a jet boat ride on the Shotover River. Next, you’ll take a helicopter ride over Skippers Canyon, and land at Deep Creek. Here you’ll be met by experienced rafting guides who will take you down through the exhilarating rapids of the lower canyon. Once it’s all done and dusted, you can settle your beating heart with a relaxing sauna and a hot chocolate in the Cavell’s Cafe and Bar. If you’re time pushed during your Queenstown stay then KJet let’s you step onto a big yellow jet boat every hour from the Main Town Pier in the centre of Queenstown. From there you’ll be transported from the sophisticated downtown area into the channels of two of New Zealand’s most scenic rivers. This is where the fun really starts, with fast speeds, quick turns and plenty of heart-pumping action. Are you ready to take to the water in an 18ft shark? The Hydro Attack shark feels like a cross between a fighter jet and a torpedo. Skimming across the top of Lake Wakatipu at 80 km/h, you can just about make out the blurry scenery before suddenly diving under water. Seconds later, the pilot will point it at the sky and blast it back out into five metres of fresh air, before shattering the lake into a million crystal shards on a screaming re-entry. The first ‘shark’ of its kind, Queenstown is the only place where you can experience this kind of adventure. The Dart River Wilderness Jet is the perfect combination of high speed thrills and heart-stopping, jaw-dropping scenery. An authentic New Zealand experience that takes you through an untouched world, you can learn about the history of the area, walk amongst ancient beech forest, and then steer your way quickly through the braided, glacier-fed rivers. 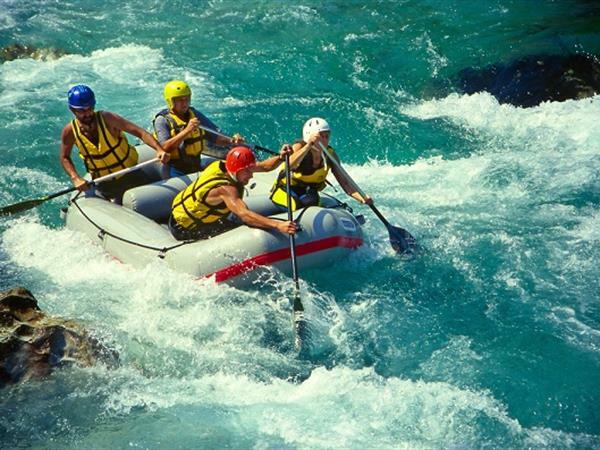 If a few days on the water sounds like your idea of fun, then Queenstown Rafting offers an amazing 3-Day Wilderness Experience that’s perfect for you. Imagine visiting one of New Zealand’s most remote areas that’s untouched, unsoiled, and visited by only a privileged few. From here you’ll paddle and camp your way down the magnificent Landsborough Valley, gliding past 2,500m mountains and hanging glaciers, and travel through dense rainforest. It’s tranquility-meets-adventure at its best. Strap into a harness and get ready for an exciting flight that will take you 600ft above water. After boarding the Paraflights boat at the main town pier, you’ll speed off along the water, your chute will inflate above the vessel, and out you’ll fly. Taking up to 12 passengers at a time, it’s a great experience to share with friends, and one that’s not too wild for the slightly faint of heart.